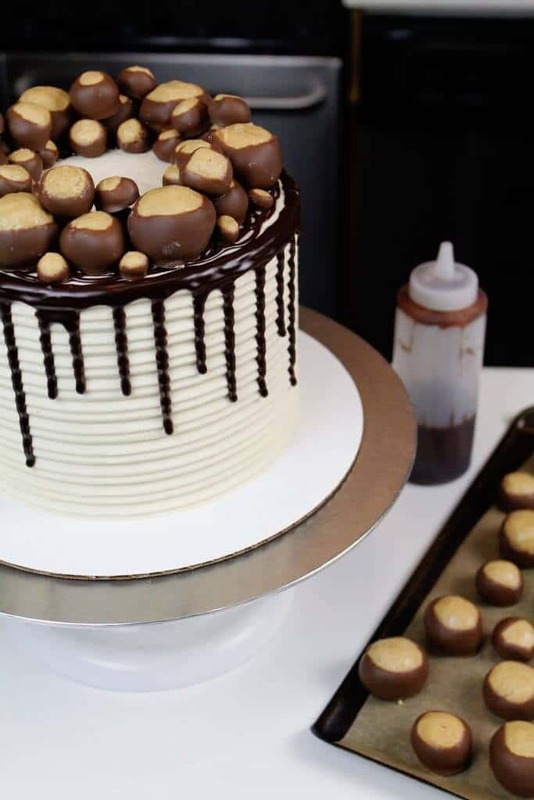 It seems like everywhere I look, I see a chocolate drip cake!! Chocolate drip cakes seem to have taken the cake world by storm. While I usually make colorful drip cakes using my white chocolate ganache drip recipe (colored with gel food coloring), I have a soft spot in my heart for a classic chocolate drip cake. 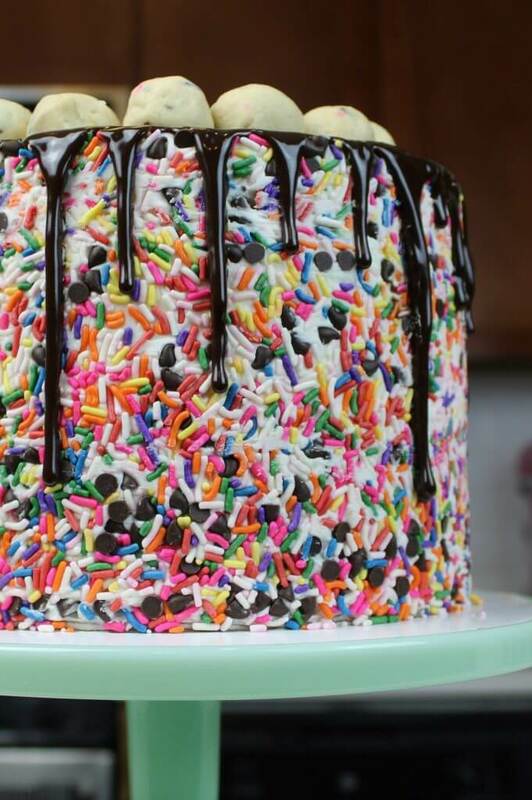 Drips are just the perfect way to dress up a cake! They’re such an elegant, yet playful way to really spruce things up. I’ve made so many drip cakes lately, I’ve started thinking that cakes look kind of naked without them! If you’ve never made a drip cake before, don’t worry! Whether you call them chocolate drippies, drip cake ganache, or drip cake icing, I’ve got you covered. I’m going to share everything you need to know to make the perfect drip cake!! It’s easier than you might think. Just because chocolate drip cakes are beautiful, doesn’t mean they have to be complicated. Let’s start by discussing the most basic part of a chocolate drip, the ingredients it’s made with! The best part of my chocolate ganache drip recipe is that it’s made with only two ingredients. All you need is a half cup of milk chocolate chips, and some heavy cream. If you can’t find heavy cream in your grocery store, you can also use heavy whipping cream. Don’t worry if you’re not in the US! I’ve included the metric measurements below. So whether you want to make a drip cake in the UK, and Australia, you can use this recipe. Sadly you can’t use regular milk in place of the heavy cream in this chocolate drip recipe. Heavy cream has 36-38% milk fat. You need that to create the wonderful consistency of the chocolate ganache. If you use regular milk, your mixture will be too thin. To make this recipe, you simply heat up the cream, and pour in the chocolate chips. Then let them sit for a minute to melt, give them a quick stir. And just just like, you have silky smooth ganache. The ratio of milk chocolate to heavy cream is super important in this recipe. Because of the chocolate in mixture, it will thicken as it cools. Having the ganache at the right temperature allows you to create those beautiful, perfect drips! Since this recipe uses chocolate and cream, it is technically a milk chocolate ganache. Most of these problems are caused by adding the chocolate ganache to a cake when it isn’t at the right temperature. You can also have issues if the cake isn’t properly chilled. If you follow my drip cake tutorial below, I promise you can avoid all of these issues!! Step #1: Chill Your Cake!! My first tip is to make sure your cake is properly chilled. Once frosted, you should allow the cake to sit it your fridge for at least 20 minutes, or in your freezer for 10 minutes. This makes the frosting cold and firm to the touch. Chilling the cake helps the buttercream keep its shape, and not “melt” when then slightly warmed ganache is added to it. It will also slow down the speed at which the drips run down the cake. This helps them from running all the way down the cake. My second tip is to make sure your chocolate ganache is the right temperature!! It should be just slightly warmer than room temperature. When I say that, I mean it should be just a tiny bit warm to the touch. If your ganache is too warm, it will be thinner than you want, and will run straight down the cake. On the other hand, if it’s not warm enough, you will end up with short, stubby little drips. Neither of these will create those beautiful, long drips. The best way to ensure your ganache is the right temperature is do a test drip. THIS IS A CRUCIAL STEP!!! Make a single drip on the side of your cake, and let it flow. Allow it to slowly run down the side of the cake, and see where it stops. 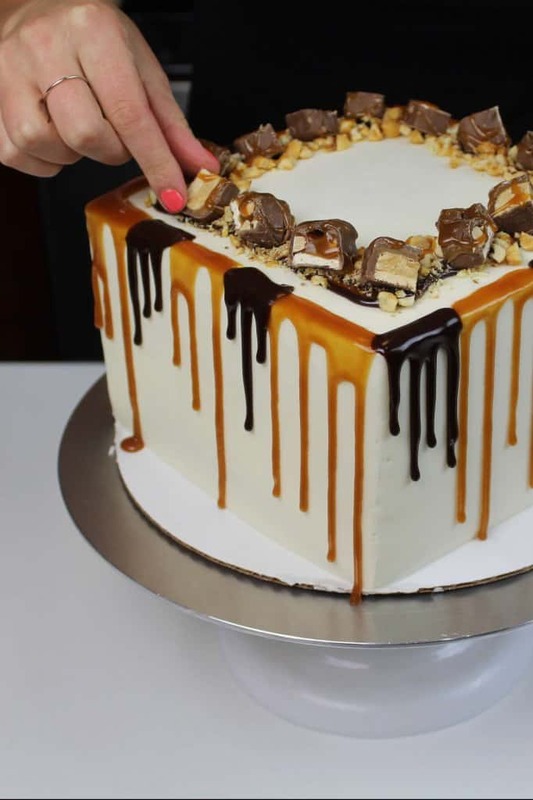 If it’s the length and look you’re after, then go ahead and add drips to the rest of the cake. On the other hand, if it’s not quite right, adjust as needed. Either pop the ganache into the fridge for a couple minutes to allow it to cool off a bit more, or heat the bottle (or bowl) in the microwave for 5-10 seconds. Then test out one more drip to be safe! While these extra steps may make the process longer, it’s worth it to make sure your drips are perfect. If you’re more of a visual learner, here is a video tutorial showing exactly how I add drips to my cakes. There are two ways to easily add colored drips to a cake. One way is to use plastic bottles. I prefer this method, since it makes the process so much easier. The ganache is contained in the bottle, and can also easily be heated or chilled. If you don’t have any plastic bottles on hand, you can also use a spoon or an offset spatula. With either tool, you can carefully push the ganache over the edge of your cakes, creating each drip. This is the method I used to make the pink drips on my circus animal cake. My fridge almost always has a bottle of leftover ganache in it. I always save any leftovers of my chocolate ganache drip recipe, since they can easily be reheated in the microwave and used on another cake. Whenever I use a spoon, I accidentally get ganache all over my counter, or on the cake where I don’t want it. I actually prefer the way drips look when they’re added to a cake using the spoon method, but I rarely do it because it’s harder to film! I like to use this drip recipe for my both my chocolate layer cakes and vanilla layer cakes, frosted with my favorite buttercream. If you try my chocolate drip recipe, please tag me @chelsweets. Also be sure to use the hashtag #chelsweets, so I can see your beautiful creations!! Place the milk chocolate chips in a heat-proof bowl, and set aside. Heat heavy cream in a heat-proof bowl in the microwave for 45 seconds to 1 minute, until gently bubbling. Gently pour the heavy cream over the chocolate chips, making sure they are covered with cream. Allow mixture to sit for 1-2 minutes. Stir slowly until the cream and chocolate are fully combined, and ganache is silky smooth. Pour into a plastic squirt bottles for easy application. If you don’t have any plastic bottles on hand, you can also use a spoon to drizzle it over cakes. Set aside to cool for about 20 minutes (or place in fridge for about 10 minutes), until the mixture is just slightly warm to the touch. Complete a test drip, to check the consistency of you ganache. If the test drip seems too thick, try heating up the ganache for 5-10 additional seconds in the microwave. If the mixture seems too thin, allow it cool a bit longer, then try another test drip. You can make my chocolate drip recipe in advance, and store it in the fridge until you're ready to use it. To get it back to the right consistency, heat the mixture in 15 second increments, or until it reaches the right viscosity. It should be slightly warmer than room temp, but to hot enough to melt your the buttercream on your chilled cake. Can you give directions that do not require using a microwave oven? Can you use this for lines on the cake too? And could you use it to make shapes on the top? Yup! Sadly it’s not thick enough to make shapes or mold into anything! You can make modeling chocolate for that though! Does this recipe make enough to cover the whole top of the cake as well as the drips down the sides? Depends on the size of the cake, but yes definitely for an 8 inch cake! i used half and half instead of heavy cream. it is not setting up. i don’t know what to do. If I’ve buttercreamed a cake and then put the ganache on the same day, can I store it in the fridge for 2 nights? Oh, and if so, how long befroe serving do you take it out of the fridge? 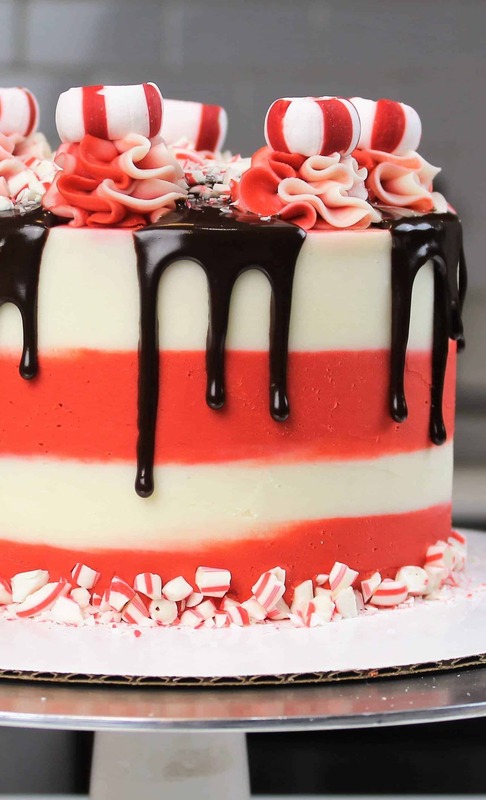 Hi thank you for all your informative posts on drip cakes! Would it work if I use a bar of white melting chocolate instead of chocolate chips? If I chop up the chocolate into small pieces ? what type of frosting do you use on the cake? It is so smooth it almost looks like fondant! Hello! Thank you for all of your cute tutorials; I absolutely love them! I do have one question though, would the ganache still work even if I frosted the cake using a cream cheese buttercream? I assume the cake would still need to be a good temperature no matter the type frosting but would that make much of a difference? aw you’re too sweet! the ganache will still work on a cream cheese buttercream!! as long as the cake is chilled you’re good to go! Hi! I love your creations and your tutorials. Thank you for sharing it all!!! Does this drip ganache firm up enough to paint with edible metallic paint? Thank you and wish you continued success!!!!! Hi I’m from Germany and we don’t have Heavy Cream, but similiar stuff. So I’m just wondering what percentage is the fat in Heavy Cream? I found pretty much everything from 5%-50%. it’s 38% fat! but as long as use anything around that, you’ll be fine! I’ve even used just whole milk when I ran out of heavy cream, and it still turned out! Hi there! 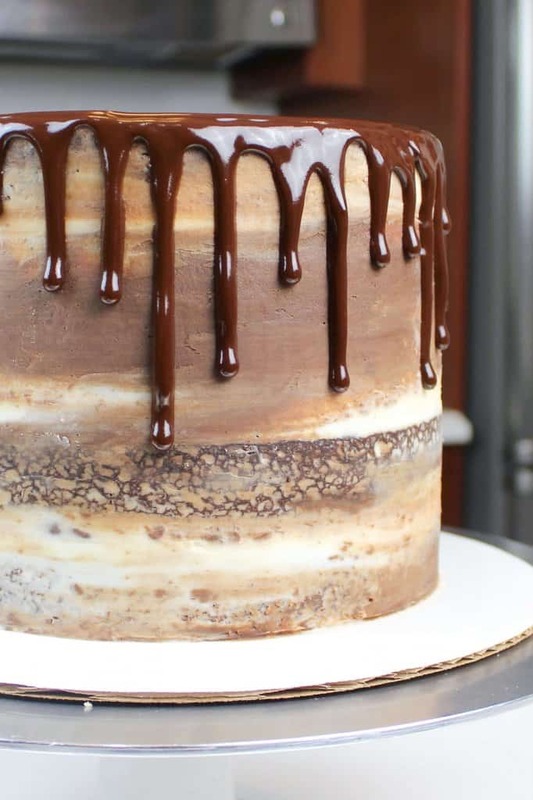 I have a question…will the chocolate ganache drip harden after it’s on the cake? 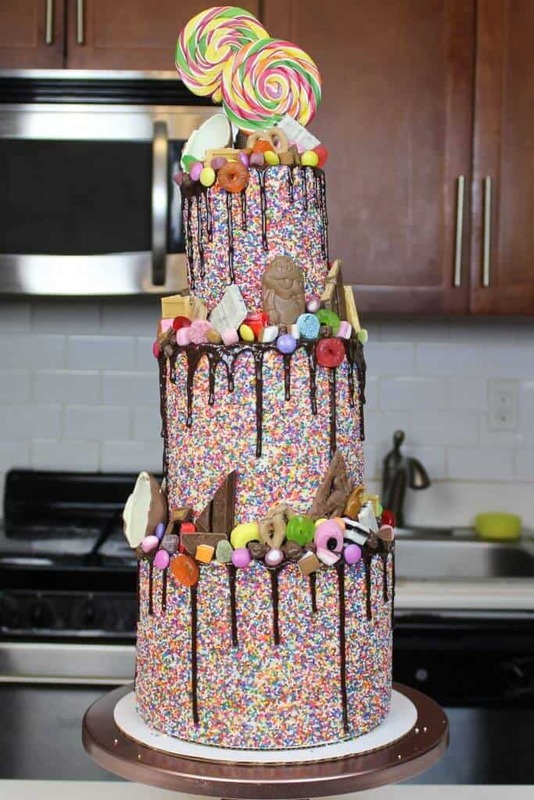 I’m planning on making this for my son’s birthday the day before we actually eat it. Also, should I store it in the refrigerator? I live in Florida and it will be hot and humid later this week. Thank you for your help!! Your tuition video is very helpful!! It doesn’t get completely solid, but they should keep in place once the cake is placed in the fridge to keep overnight! As long as it’s indoors, they should be fine as you allow the cake to warm back to room temp before eating it. I don’t think it’d hold up well in direct sunlight or really high temps though! yes, it can be made in advance! It keeps in the fridge for up to 2 weeks! Love your tutorials!! Thank you for being so informative. Can this recipe be used as a filing in between layers? Would it have to be cooled completely? I’m making a chocolate cake with a cream cheese buttercream frosting. I made this last night, and it was delicious. Everyone loved it. However, I felt like it was a little thick. I squeezed it from a bottle, and a bunch was stuck to the bottom. It only cooled about ten minutes. Should I increase the ratio of heavy cream? Mine didn’t drop as far as yours in your videos but it didn’t cool as long as yours did in these instructions. Hi, I love everything you do. I follow you from Spain! 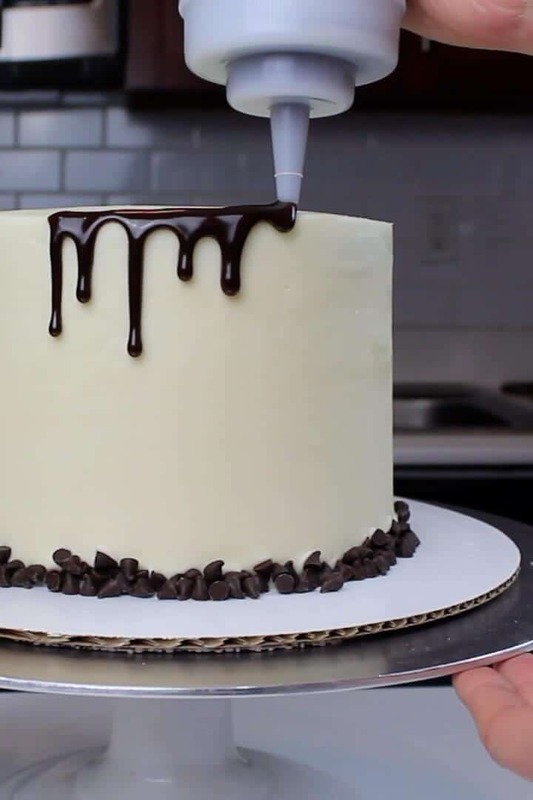 In the video tutorial that shows the drip you use a dark chocolate for the sides and it seems that for the top part it is lighter. Is it milk chocolate? Is the same proportion of ingredients used as with dark chocolate? Aw thanks, you’re too sweet! I think that’s just the lighting and my camera! I usually just make one batch for a cake! You can use milk or dark chocolate, but you will need slightly more heavy cream with dark chocolate than milk chocolate! In the video you said you use equal parts chocolate to heavy cream but in your recipe on your site it’s different. It’s 1/3 cupheavy cream to 1/2cup chocolate. Which is better? Can you add black americiolor gel to this to make it a true black? Also can you drop this over fondant? you can definitely make a black drip with americolor black gel food coloring. I have never added it over fondant, only chilled buttercream. I don’t think it would work well on fondant, because the cake needs to be chilled ?